Dubai is a juxtaposition of a city. It’s full of wealth and flash thanks to royals and oils yet the religion presiding over it values modesty. And seeing a city of such contrast is priceless. Known for its flashy cars, designer hotels, multicultural food scene and architectural masterpieces, Dubai melds two different worlds of East and West and has attracted over 200 nationalities to live there as expats. 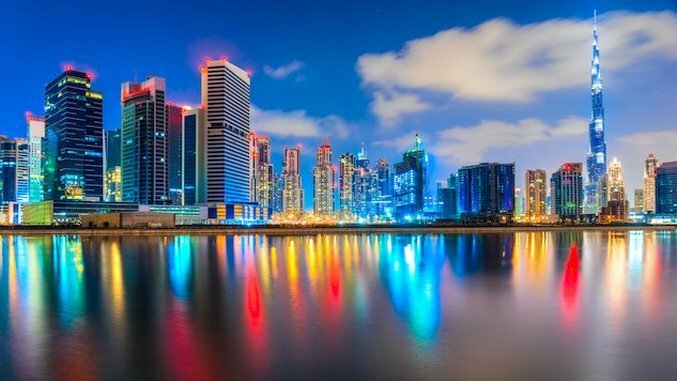 With so much ground to cover, Paste Magazine assembled a list of must-sees while in Dubai. Dubai’s equivalent of New York City’s Williamsburg, the Al Quoz District is Dubai’s industrial bohemian neighborhood with many resident creatives. Alserkal Avenue, known as the warehouse district, even though those warehouses are now art galleries, performance spaces and coffee houses (sound familiar? Cough, Meatpacking District, cough). Galleries to checkout include the Green Art Gallery, which focuses on contemporary art from the Middle East, North Africa, and Turkey; as well as Ayyam Gallery , which houses a remarkable collection of blue-chip art. Swing by Wild and the Moon, a healthy snack and juice bar; and Nightjar, for eye-popping espressos. Resting on the Arabian Gulf, Kite Beach in Jumeirah is Dubai’s most well regarded spot for surfers, paddle boarders, windsurfers and kite surfers, as well as curious spectators. On Kite Beach, two Emirati women launched the first Emirati-owned food truck in the UAE: Salt. The glimmering silver food truck fashioned after a 1950s streamliner is famous for its milkshakes and burgers, which boast quality ingredients and inventive twists on classic fare—try the Chicken Cheetos burger, which integrates Flamin’ Hot Cheetos, a surprisingly delectable addition. And they are not just a food truck; Salt has table service and outdoor seating in the sand overlooking the gulf, as well as in the all-glass, air conditioned restaurant (a respite from the sun, since it’s hot year-round in Dubai). After lunch at Salt, rent a paddle board or go kite surfing, with or without an instructor. There’s also a running path along Kite Beach with outside gyms dotting the track. Once just sand, Old Town Dubai is the oldest area in the city (obviously). Visitors can experience the Dubai Museum to learn how this marketplace appeared and Dubai sprung up. The historic neighborhood of Al Fahidi is peppered with various souks where merchants from neighboring countries have peddled gold, spices and perfumes since the early days of Dubai. Old Town Dubai is world-famous for its gold prices: here the gold is sold for to next to nothing (compared to Western prices). While meandering through the souks, nibble on some local dates and camel’s milk chocolate—the country’s traditional desserts. Because Dubai is known for its architecture, a helicopter ride over the emirate is a unique way to view the city. This way, you’ll get an aerial view of the Burj Khalifa, the tallest building on the planet; the World, the in-progress man-made assemblage of islands resembling … you guessed it … the world; and the Palm Jumeriah, an artificial archipelago created to look like a palm tree. Heli Dubai’s helicopter tours depart from Dubai Festival City and offer 12 and 22-minute rides, so if you’re prone to motion sickness, you don’t have to sit this one out. You can ride solo or with a group. Take a ride at sunset for an unforgettable scene of Dubai; although costly, it’s worth the splurge to see the city lit up. Because Dubai is under Sharia law, tipplers are only permitted to drink libations within hotels. The tallest hotel in the world, the JW Marriot’s 71st and 72nd floors house the Vault, a cocktail bar with panoramic views of Dubai. On the outdoor terrace on the 40th floor of The H Hotel, 40 Kong is the tallest rooftop bar in Dubai, and known for its cachaça and limoncello cocktails. For a different vibe, the owners of NYC’s Miss Lily’s recently opened their Dubai outpost, also called Miss Lily’s, at the Sheraton Grand Hotel. Miss Lily’s Dubai has creative Jamaican cocktails, a rum bar and kitschy Caribbean décor. In Dubai, the weekend starts Thursday night and everyone returns to work Sunday. As America celebrates brunch Sunday, Dubai expats do brunch Friday. Hotels across Dubai host these boozy meals, and they don’t just serve up eggs benny. Dubai hotel restaurants arrange lavish and generous (it is Dubai, after all) spreads of buffets and bottomless drinks for those looking to enjoy a raucous Friday morning/afternoon … /evening. Try brunch at the W Hotel Dubai or at the Atlantis’ Saffron. Word is they’re the wildest in town. Fashion designers Versace, Armani and Bulgari have all invested in namesake properties and high-end hotels in Dubai. For an elegant meal, settle into dinner at Enigma at the Palazzo Versace (the hotel created by Donatella). Enigma offers inventive Turkish cuisine created by chef Yunus Aydin, who grew up in Marmaris, a port town on the Mediterranean coast. The menu uses only the freshest ingredients and changes often. Platinum Heritage Luxury Tours and Safaris offers desert packages that sound touristy, but are actually life changing. And even if they are touristy, this is what there is to do in Dubai. Trust us, you’ve never seen the sand so gold. And the best ways to experience said sand is from above or bumping along. A driver picks up guests at their hotels before sunrise to take them out of the Dubai metropolis and into the sprawling desert. Upon boarding colorful hot air balloons, guests can see Dubai’s neighboring country, Oman, and camels and antelope down below. The hot air balloons land somewhere in the Dubai sand dunes, and pristine vintage Land Rovers—left by the British after World War II—take guests to Bedouin tents where breakfast is prepared and served. The Jumeirah Mosque is the only mosque in Dubai that allows non-Muslims to enter. A white structure made entirely of stone in the late seventies, the mosque rests next to the beach and is said to be one of the most photographed mosques in Dubai. It also provides a lesson in Dubai’s culture and religion. Women are asked to wear scarves and reservations must be made in advance. Eva Fedderly is a travel and legal journalist who writes for Travel+Leisure, Esquire and The Christian Science Monitor, among other publications. She’s lived in New York City, Los Angeles, San Francisco, London and currently resides in Savannah, Georgia.